Birds are associated with Christmas. Robins are a favourite on Christmas cards and turkey more than any other bird is eaten at Christmas. It is estimated that around ten million birds will be slaughtered this Christmas in the UK as part of a multi-million pound industry. The vast majority of these birds are reared indoors in purpose built buildings of many types. The great majority of domesticated turkeys have been bred to have white feathers because, when plucked, the feather sockets are less visible when the carcass is prepared for eating. From the point of view of food, modern breeding has made turkeys much heavier than their wild relatives and more or less flightless. Where did these wild relatives originally come from? Not Turkey. There seems to be no connection with the country Turkey. The wild turkey (Meleagris gallopavo) is native to North America and is the heaviest member of the Galliformes. It is the same species as the domestic turkey, which was domesticated from the South Mexican subspecies of the wild turkey by the Aztecs. The Spaniards brought this tamed subspecies back to Europe with them in the mid-16th century; from Spain it spread to France and later Britain. 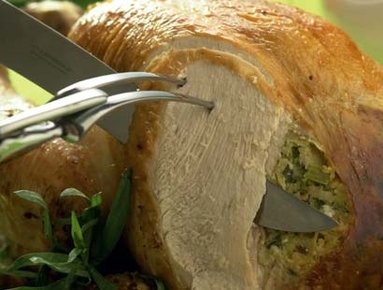 The 16th century English navigator William Strickland is generally credited with introducing the turkey into England. By 1620 it was common enough so that the Pilgrim Fathers from England took the bird back to North America, unaware that it had a larger close relative already occupying the forests of Massachusetts! Unlike their domestic counterparts, wild turkeys for their size are surprisingly agile fliers. They are very cautious birds and will fly or run at the first sign of danger. Their ideal habitat is open woodland where they can fly beneath the canopy top and find perches. They usually fly close to the ground for no more than a quarter mile. Adult wild turkeys are magnificent birds, particularly the males, which are larger than the females. Although looking generally black his feathers have areas of red, purple, green, copper, bronze, and gold iridescence. Males have a large, featherless, reddish head, red throat, and red wattles on the throat and neck. The head has fleshy growths called caruncles. The long fleshy object over a male's beak is called a snood. When displaying, these various areas of bare skin on the head and neck all become engorged with blood, almost concealing the eyes and bill. When a male turkey is excited, its head turns blue; when ready to fight, it turns red. Together with puffing out their feathers, spreading out their tails and dragging their wings, their display is aptly called strutting. Added to this visual display are many vocalisations including the famous "gobble" that can carry up to a mile. The purpose of the male display is to attract and mate with as many females as possible. In the early 1900sk loss of habitat and over hunting had a severe impact on wild turkey numbers in North America. In some states they became extinct. More recently a well managed re-introduction programme has helped reverse this. 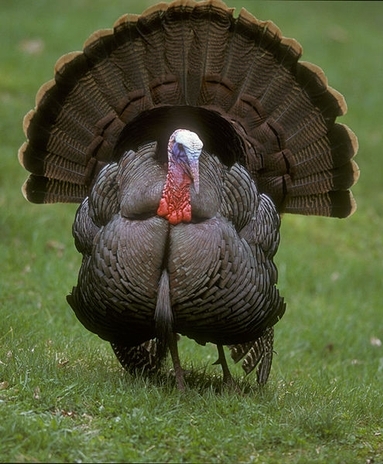 In the last decade the wild turkey has been successfully re-introduced to more than twenty states in North America.